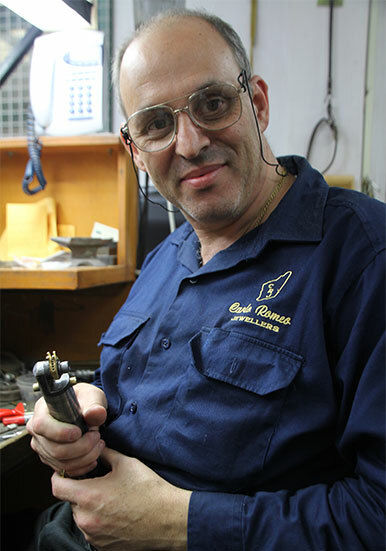 Established in 1987, Carlo Romeo provides a bespoke jewellery design service from his Perth workshop. Designing individual jewellery pieces for his clientelle for over 30 years, Carlo has built a reputation for quality and workmanship. Carlo specialises in Diamonds, Rubies, Sapphires and Emeralds and can design that special ring or any other piece of jewellery you desire. Carlo also undertakes valuations complete with photographs as well as quality repairs and restoration to all kinds of jewellery including insurance claims. Come in and see Carlo and his friendly experienced staff at his workshop for an obligation free consultation to design your special piece. Exclusive 3D print technology allows you to create a wax prototype to ensure your unique jewellery piece is as perfect as you imagined it to be. Carlo Romeo Jewellers are a distinctive innovative and skilful team of professional jewellers specialising in making dreams come true. If you can imagine the design, they can create it. Visit our gallery for examples and inspiration. Whether it be a special ring, bracelet, pendant or charm you desire, Carlo and his team can design that special piece that will be as individual as you are. New exciting 3D Print Technology allows us to create a 3D image of your design and create a wax prototype of your jewellery piece on the 3D Printer. Once every detail is perfect - we then make it to that exact design using precious metals and stones to create an outstanding piece of wearable art. This exclusive technology makes designing your unique jewellery item very affordable with prototypes created from as little as $250. Carlo Romeo Jewellers specialise in Diamonds, Pearls, Rubies, Sapphires and can supply Champagne, Whites and Pink Argyle Diamonds to create that special ring or piece of jewellery to your individual requirements. Visit our gallery for examples and inspiration. Our Jewellery FAQ page for more information on Diamonds and selecting jewellery as well as Carat Gold, Platinum, Caring for and Cleaning your Jewellery and more. Carlo Romeo Jewellers offer a professional jewellery valuation service including photographs. We also specialise in repairs and insurance work. Have old broken gold jewellery at home that you no longer wear? Recreate it into a beautiful bangle that you will wear everyday – we have many different designs, please call to discuss your requirements or make an appointment through our contact page. Creating beautiful, inspired jewellery pieces are our absolute speciality. Carlo Romeo provides a free, no obligation design consultation by appointment. Jewellery design encompasses many variables, therefore we cannot provide quotes via emails. Please make an appointment through our contact page for a FREE, no obligation consultation. Carlo commenced his apprenticeship with C & K Jewellers in 1979 receiving his Trade Certificate in November, 1984. In 1987 Carlo established his own workshop and has since been providing his clients with individual designs made especially for them. Whether it be a special ring, bracelet, pendant or charm you desire, Carlo Romeo and his team can design that unique piece that will be as individual as you are. New technology allows us to create a 3D image of your design for your perusal before creating the piece. We can then print a wax prototype of your jewellery piece on the 3D printer for you to try out. When you are completely satisfied with the final design, we will then make it to that exact design using stones and precious metals to create an outstanding piece of wearable art. If you have old broken gold jewellery at home that you no longer wear, we can re-build your old gold jewellery and create a beautiful bangle or other piece of jewellery that you will wear everyday. We have many different designs to choose from or together we can come up with a truly unique design just for you. Carlo looks forward to you becoming one of his very satisfied clients who keep returning for all their jewellery needs. Call us to discuss your requirements or make an appointment through our contact page. Whenever I call upon you for assistance, ideas and support, I know that you always give 110% just like you did for my 80th Birthday surprise to my wife and family. The idea of presenting my wife, my girls and my grandchildren with a Gold Medal which they can always remember me by and to know where their roots originated from formed from within and with your invaluable assistance and hard work we were able to achieve this magnificent accomplishment. One that I am extremely proud of and honoured to pass onto future generations. I know sometimes I ask for the impossible however, you are always there to assist and bring to fruition my dreams. Thank you for joining my family and myself on my special 80th Birthday celebration at Mia Cucina, it was an honour to have you help celebrate my milestone. I hope you and Michelle enjoyed yourselves as much as I did. Please accept my sincere appreciation for everything that you have done for me in the past and know that I genuinely cherish our friendship. she loved so I took it in and Carlos was very helpful and knowledgeable. Our daughter was over the moon with it, thank you Carlo. I have since had a bangle made for myself which was Carlo's own design and another beautiful piece. Now I'm patiently waiting for Carlo to re model a ring and can't wait to see it. Carlo Romeo has produced and supplied quality jewellery to my family and myself for over ten (10) years. rebuilding Rolex watch and many other hand made tailored pieces to suit the family’s needs. With precise construction to unusual and delicate designs, Carlo has always perfected these pieces with utmost precision. Thanks Carlo for your next exciting piece whatever that will be in due course. Just want to say a big thank you for the incredible work and craftmanship on my engagement ring, wedding band, eternity ring, my husbands wedding band and also my diamond ear rings. All the pieces are beautiful and perfect. Thank you so much, we love them. Thank you so much for the beautiful work you have done in making our wedding bands. We love them. Thank you also for the magnificent bangle. It is perfect. I have had countless people stop and admire these beautiful pieces of work. Thank you for helping make a 30 year dream come true! It is truly a beautiful ring – I love it! 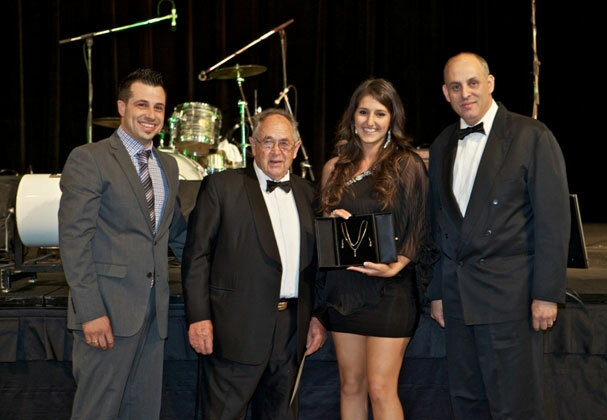 Carlo Romeo Jewellers contributed as a sponsor of the 20th Anniversary of the Italian Australian Apprentice of the Year Awards. 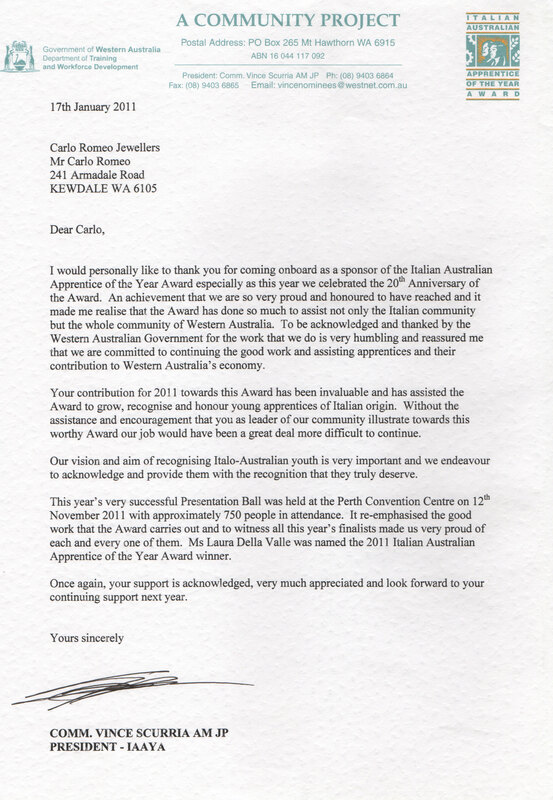 This Award was established to grow, recognise and honour young apprentices of Italian origin.